Officially, "smorgasbord" is defined as a Scandinavian buffet-style meal with a variety of cold dishes arranged on a table. The smorgasbord has been part of the Hyllningsfest celebration since the event&apos;s inception in 1941. Today, organizers plan three settings to accommodate over 1400 guests. My friend Susan and I were among the first to enter the dining hall for the 8:00 meal, so we saw the buffet in its glorious, untouched beauty. The description on the festival website promised more than 35 items on the menu, including, "6,500 meat balls, 325 pounds of potato sausage, 60 dozen deviled eggs, 3,000 cookies of various kinds, 60 pounds of pickled herring, 70 loaves of Swedish rye bread, 45 tea rings, 200 pounds of ostkaka, 30 large smoked salmon and 30 pounds of coffee." I may have eaten a dozen of the deviled eggs, and no one complained. 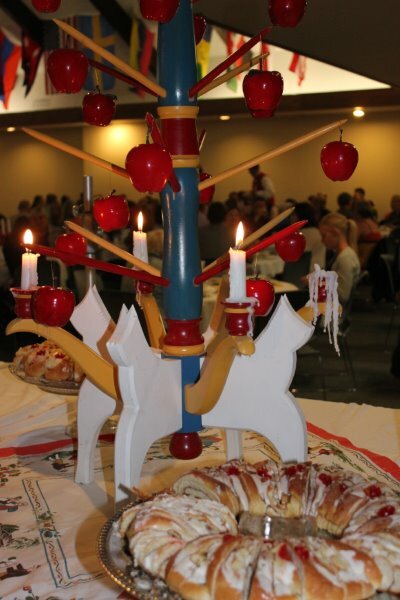 The attractively tiered table was filled with traditional Swedish dishes. Some, like creamed peas and dilled potatoes, were similar to my family&apos;s German cooking tendencies. The fish dishes were new to me, but part of the fun was trying a little bit of everything. In fact, I heard more than one person mention, "Oh, and maybe just a taste of the herring." My favorite was absolutely the potato sausage for its unusual hint of spice (which is allspice, I later learned). The Swedish meatball and rye bread also get high marks. I would to devote a small special paragraph to the hard tack. Served up in the shape of a disk with a hole in the middle and stacked on a spindle, my research recommends packing this "crisp bread" on long ocean journeys. I&apos;m not sure the name "hard tack" is doing this bread any favors. I thought it was delicious smeared with real butter and lingonberry jam. Beautifully decorated tea rings, ostkaka topped with lingonberries (Swedish-style cheesecake) and spritz cookies (similar to my version of shortbread) were the highlights of the dessert table. Coffee came with the dessert course. At the time I didn&apos;t know to ask, but now I wonder if the coffee was the traditional Swedish egg coffee made with a beaten egg to "clarify" the coffee and "subdue" the acidity. Susan and I were fortunate enough to sit next to two long-time Lindsborg residents. Although our tablemates had recently retired to Baldwin City, our dinner conversation was filled with happy interruptions from close friends and former colleagues welcoming them home for the festival. The dinner program was a slide presentation about the Lindsborg Swedish Folk Dancers - now celebrating their 50th year as an organized troupe. Still in a bit of an ostkaka stupor, I had one of those perfect moments that you want to capture in a little mental picture. I knew the weekend would be full of parade excitement, dancing, and more eating, but, for that instant, I was surrounded by new friends and a dear childhood friend. I felt part of the Hyllningsfest tradition, and I was grateful that this little piece of Sweden happens here in Kansas.